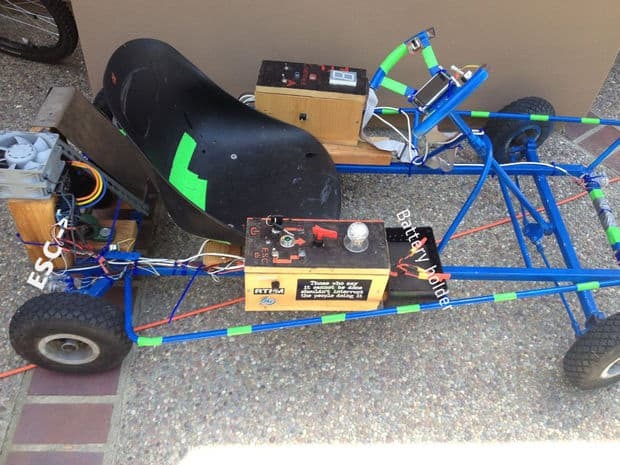 If you’re looking to build a DIY go kart, you’ve come to the right place. We’ve assembled a mega-list of 32 go kart project blueprints. Scroll through the list, gather inspiration, and click the green View Plans button to view the source blueprints. These open-wheel cars come in a variety of shapes and styles. Some are motorless, while others are high-powered racing machines. The most basic style of go kart is a gravity racer. These are commonly known as Soap Box Derby carts- they lack motors and gain momentum speeding down hills. A recreational go kart is frequently powered by electric motors or four-stroke engines . High-performance racing racing typically employ two or four -stroke engines. Generally, go karts are single seaters and are rarely built to handle passengers. Some of our favorites include a Wii-controlled kart, vintage children’s racer, a recycled riding lawn mower go kart, and even a solar-powered option! Are you interested in kart racing? Then you can try to build a powerful and easy to control go- kart using this plan. The model features a 36″ x 24″ frame, custom hub motors and a speed of 22 miles per hour. 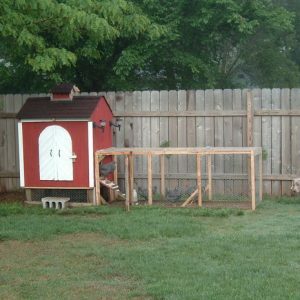 However, the builder warns that this is not a novice-friendly plan and some of the fabrication technique he uses might be dangerous for someone with little experience. It’s also not a very cheap project, and if you have to buy everything be prepared to spend over $1000. 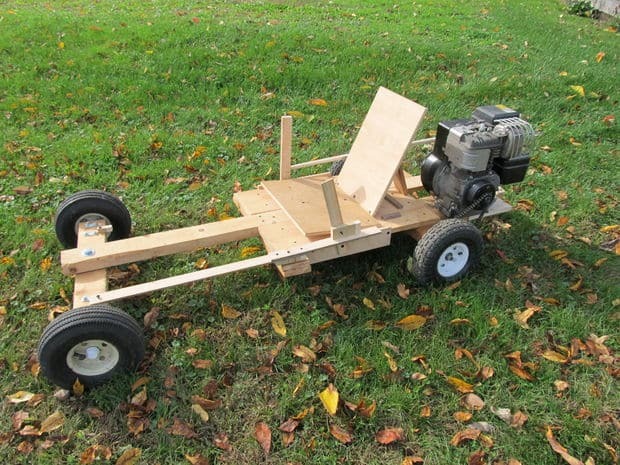 This plan will help you build a simple wooden go-kart in eight steps. What’s great about it is that you can customize it per your desires, paint it, and you can even add a seat if you feel like it. 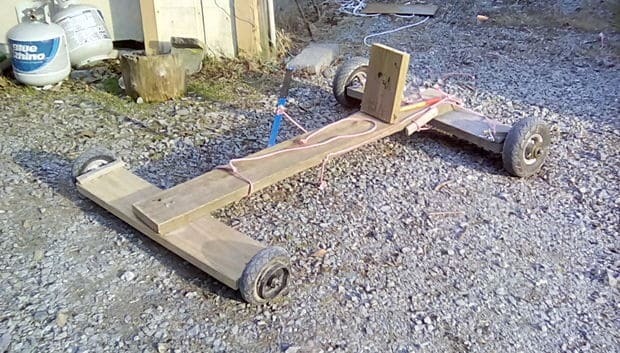 To make this mini go-kart, you’ll need 10 foot 2×4 lumber, three non-swivel wheels, construction screws, wood screws, bolts, and nuts. 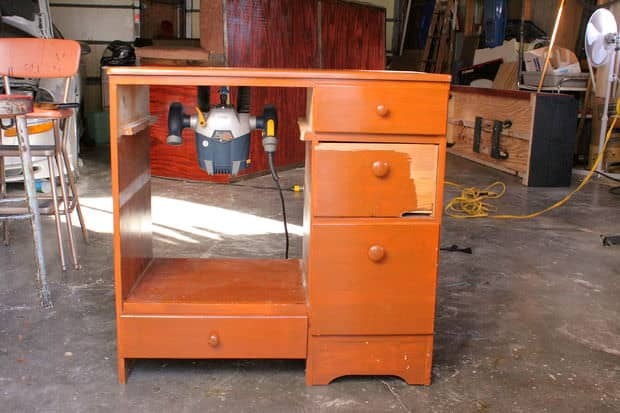 As for the tools, you require just the basics – a drill, a chop saw, and a sander. 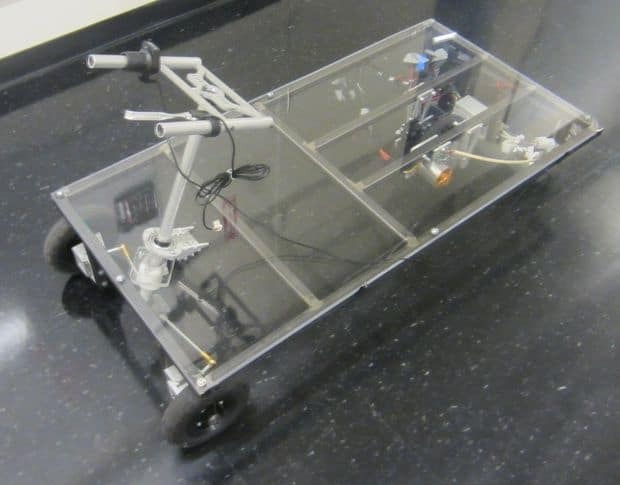 This free plan will help you build an electro go-kart powered by Arduino. It features a speed of 30 miles per hour, a sensorless motor, 10″ tires, and chain drive ratio of 1:10. 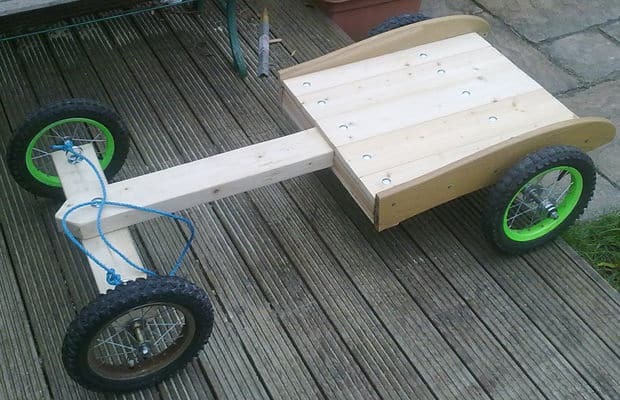 This homemade go-kart is suitable for someone who knows enough about electronics so don’t attempt to build it if you are a novice. The motor might need a small push to start, and the builder warns that you should never attempt to start it under load. If your child loves kart racing, then he will fall in love with this retro go-kart that looks just like a small vintage car. The kart is made of wood even though it looks metal, and it has all the necessary features to delight both children and adults. I’m talking about the adjustable car seat, the luggage space, the 20″ bicycle wheels, voltmeter gauges, the break handle, and the 350W engine. The builder warns that measuring your child correctly is crucial for designing the car’s body. 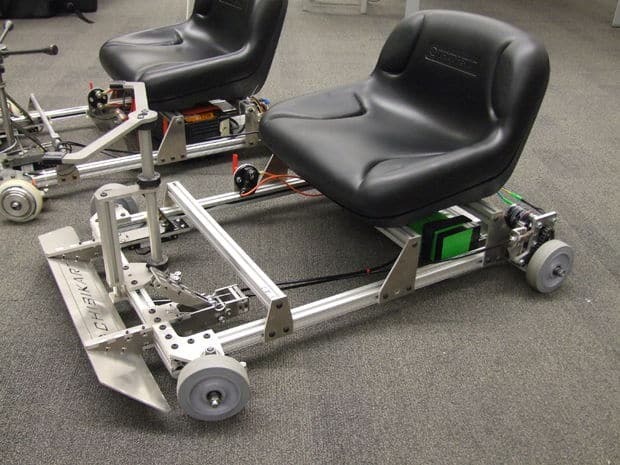 This simple go-kart is perfect for those that want something functionally but cheap. You just have to find four wooden boards, four wheels, nails, and bolts. As a brake, you can use a metal rod/ bar. You can pick whatever wheels you want and get nails and bolts to match them. However, the builder doesn’t go into details, and there are no pictures to help you build this kart. A gravity-powered go-kart is perfect for those that want their children to have fun and learn some basic driving skills at the same time. However, this instructable is more useful to those that have an idea for a go-kart in their minds and are looking for inspiration. It’s not for those that want step-by-step instructions because the builder uses mainly scrap materials. What’s more, the main disadvantage of this kid’s go-kart is your children will have to push it up an incline for it to work. This electric go-kart is an excellent choice for those of you that want something that could be useful even off the racing tracks. This model has three wheels, in contrast to other designs, an electric motor, and a seat for a passenger. Yes, that’s right. You can take your friend for a ride in this two person go-kart. 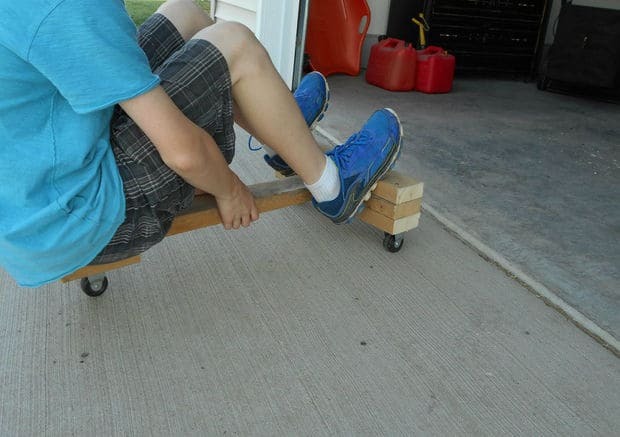 There are detailed instructions how to build this go-kart from the frame to the motor. However, this is not an easy construction, and it requires skills and knowledge that might be beyond the abilities of a novice. 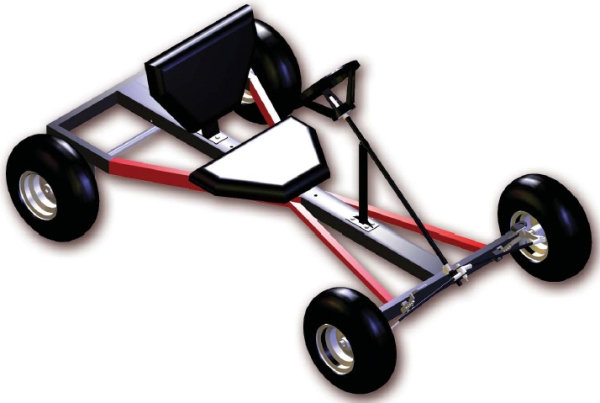 This amazing go-kart could be a nice surprise for any child or adult interested in kart racing. 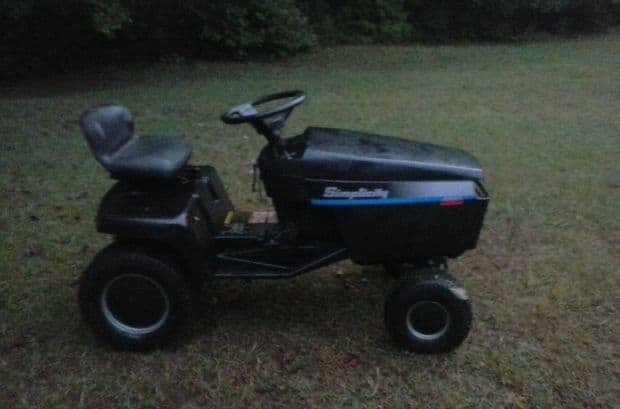 It features brakes, bumpers, adjustable chain, a chain guard, and a mower engine. What’s great about this free go-kart plan is that the builder has included many pictures with notes to make it easy for you to build it. There are also some tips on where you can find go-kart parts. Before you start building this metal go-kart, you have to plan everything very carefully. Decide how long and how wide you want your kart frame to be and then draw the design on a big sheet of paper. The builder recommends that you build a jig first so that it will be easier to construct the frame. You also need a horizontal bandsaw to cut the steel and experience in welding and soldering. Do you want a simple but fully functional go-kart? Then you can try this amazing design which features a plastic chair as a seat. However, keep in mind that the plan doesn’t feature brakes, and you’ll have to find a way to add them yourself. There is a list of materials that you’ll need and some pictures to help you along. As for the tools, you require a wood cutter, a plastic cutter, and a drill. 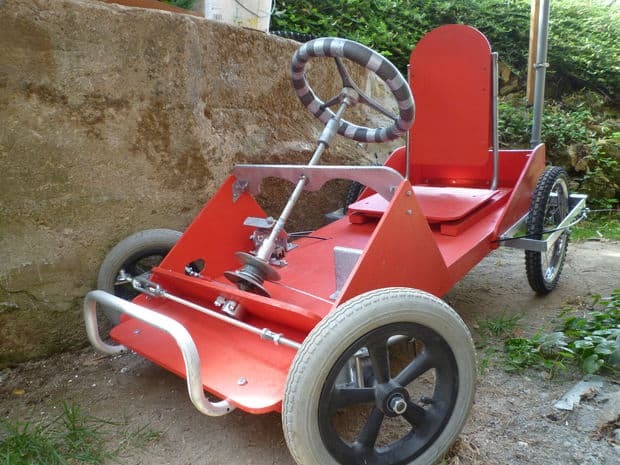 If you have an old gas-powered kart, you can use this plan to turn it into an electric go-kart. However, don’t expect this to be a quick project and it might be difficult to find all the material. What’s great about his go-kart is that it can go up to 50 miles per house, but you should know that the plan doesn’t feature chain guard. There is also an explanatory video clip that you must watch to learn how to build this go-kart. 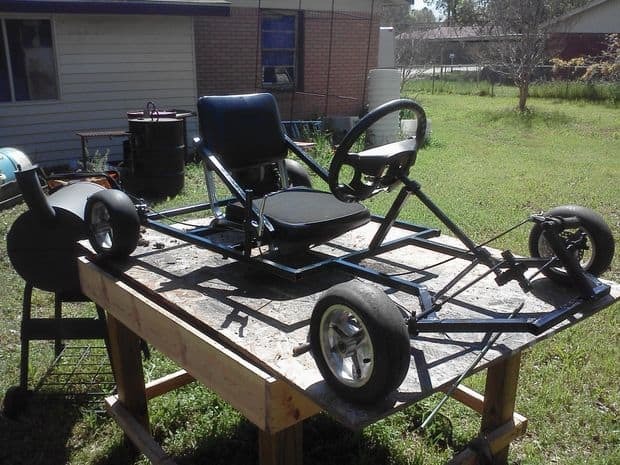 This cool homemade go-kart is the perfect choice for a DIY fan who doesn’t want to buy an expensive go-kart. You can build this beauty for several days, and it will cost you almost nothing if you have some spare parts lying around. The builder uses 1″ square steel tubing for the frame and old mini bike tires for wheels. He recommends that you add a transmission if you want to be able to shift. 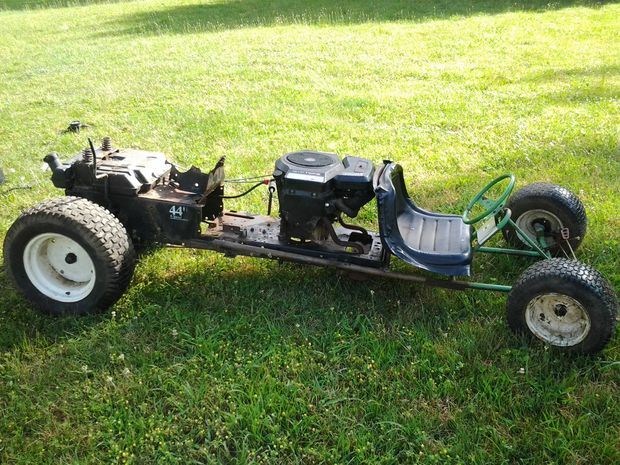 To power this DIY go-kart, the builder uses a gas turbine. The engine is also homemade, and the whole project might take more than three months to complete. 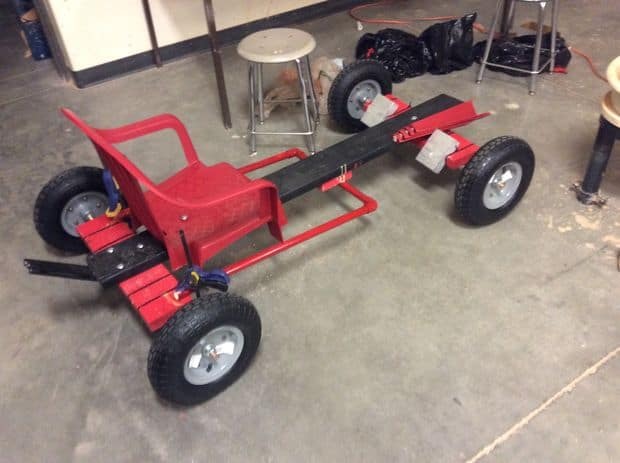 Unfortunately, there are no detailed instructions to help you build this awesome go-kart, but there is a video you can watch for more information. Also, keep in mind that this is not a cheap homemade go-kart and it might be less expensive if you buy a new one. If you purchase an old bike, you can try this plan to turn it into a fantastic race go-kart. 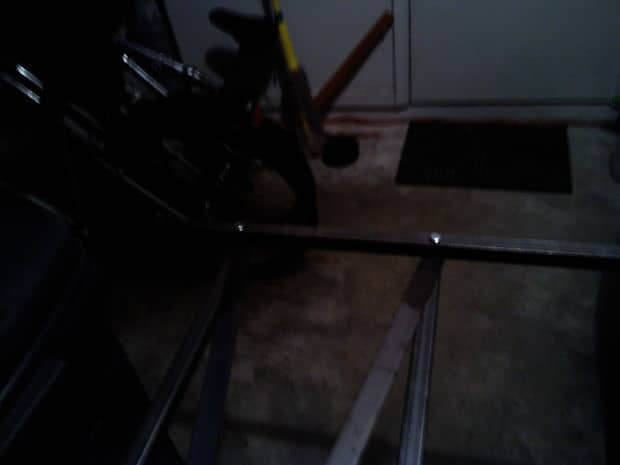 You must have an angle grinder, MIG welder, some basic tools, and enough space in your garage. You’ll also need the front end of a lawnmower. The builder advises that you choose the used bike carefully since it’s crucial for achieving the specification you want. He recommends a 998 Suzuki Katana AY 50. 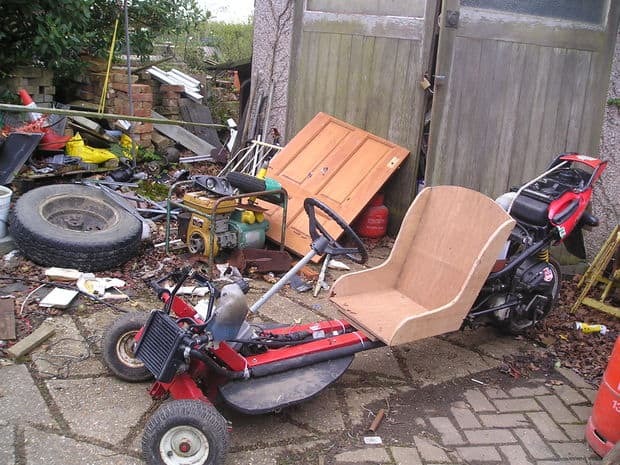 The plan will help you turn your old riding mower into a go-kart with the aid of a go-kart frame and some basic tools. The most challenging and time-consuming part of the project will be disassembling the riding mower so be careful and follow the provided instructions. You’ll also need an engine, a seat, break cables, and throttle. 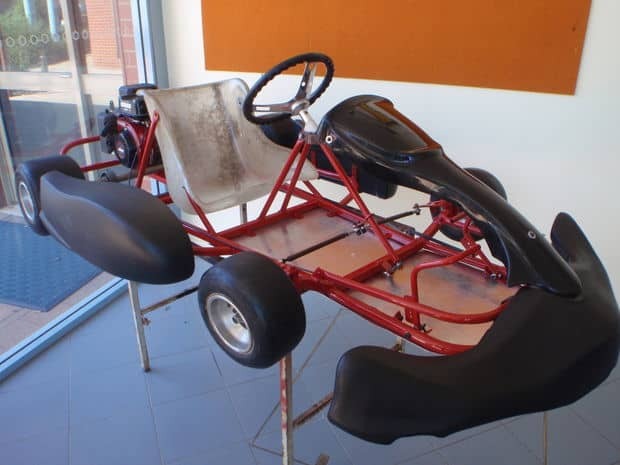 This race kart is perfect for those that are looking for something inexpensive and suitable both for children and adults. 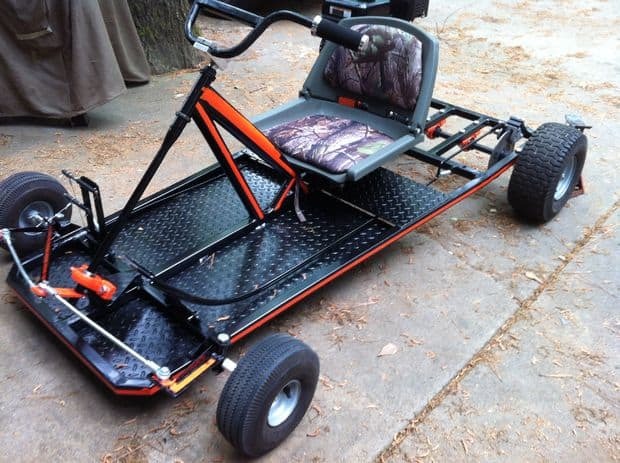 The first step in making this go-kart is choosing what lawnmower you’re going to use as a base. It all depends on where you’re going to drive your go-kart. The builder recommends a model with a lot of space between the ground and the bottom frame for those going up the mountain. For this plan to work you’ll have to remove the mower’s deck, so it’s not important for the project. Just make sure that the mower runs and doesn’t leak. 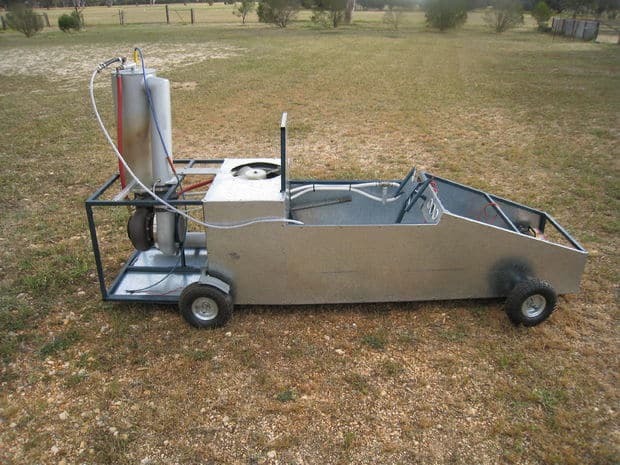 If you have little experience in welding, you might be looking for a go-kart design that doesn’t require such skills. Then this plan might come in handy. But the bad thing is that the builder doesn’t offer step-by-step instructions so it might be very difficult for a novice DIY fan to build this go-kart. However, the good thing is that there are some videos you can watch that show the building process. This mix between a scooter and a go-kart is built with minimal skills. For the rear, the builder recommends Yamaha BWS scooter because it will provide everything you need for your go-kart -brakes, tank, wheels, cables, etc. However, there are no detailed instructions provided, but the builder does provide some pictures to help you along. Keep in mind that the petrol tank is behind the driver’s head which is a big safety concern. You can make this simple off road go-kart with the help of four wagon wheels, 100 zip ties, one plastic chair, rope, two threaded rods able to support up to 100 lbs, and some wood. The good this about this design is that the builder provides you with well-written instructions how to build this go-kart. But keep in mind that there are no go-kart brakes and that you’ll have to use the rope to navigate. 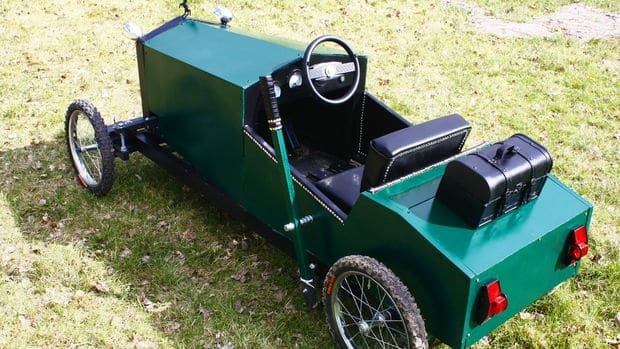 To build this cool go-kart, first, you need a used gas powered go-kart one which you’ll transform into a solar one. What’s also great about this solar go-kart is that the builder has made a list of all necessary material and where you can find them. It’s available in PDF file for your convenience. However, you should have experience in welding and machine work. But it’s worth your efforts since this beauty runs with a speed of 20-25 miles per hour and since it’s powered by the sun, you shouldn’t worry about how far you can go. 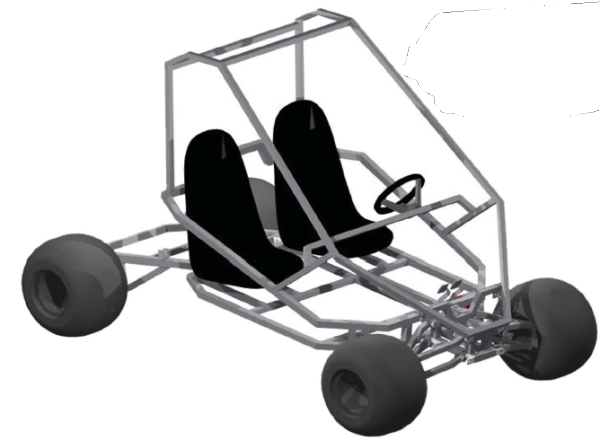 Before you start building this cool go-kart, you must decide what kind of go-kart you want and where you’re going to drive it. 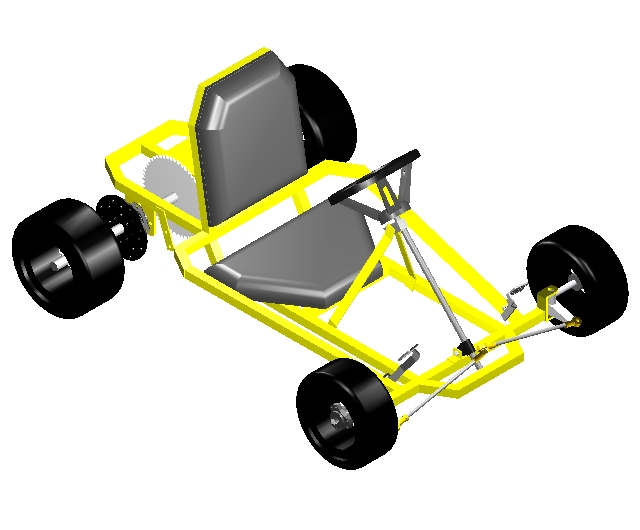 The builder offers some excellent options that you must look at and then draw out how you imagine your kart would look. As for the material, the builder recommends metal over wood and gives you some tips where to find a cheap one. This motorbike/go-kart has a pretty impressive design and specification that will suit any go-kart racer. It features a 110cc bike engine, four gears, front and seat suspension, a racing kart seat, and 1.5″ steel tubing for the frame. However, the builder provides you with only a brief video explaining the process and recommends that you buy a book that teaches you how to build your own buggy. This cool go-kart is made out of two used bicycles. The idea is that you’ll have one main bike and a motorcycle sidecar welded to it. The motor is an old 4HP Briggs and Stratton horizontal one, but you can try the plan with whatever model you have on hands. 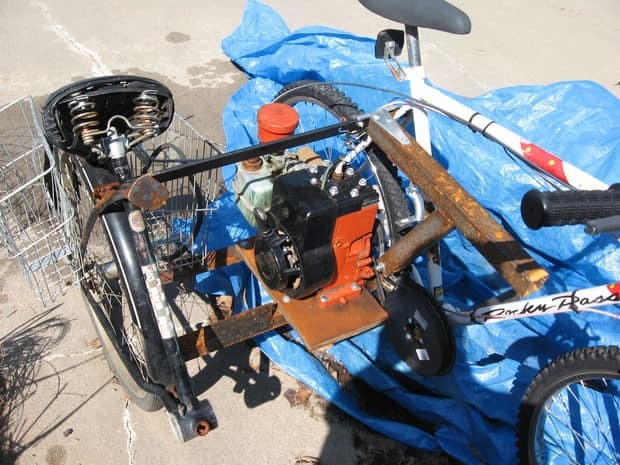 However, don’t expect that this bicycle go-kart will go running like the wind, especially if you use an old engine. And since there are no pictures of the building process, you’ll have to rely on your intuition and creativity. 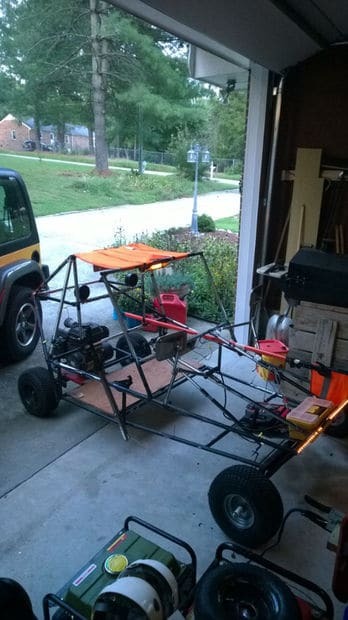 For someone that loves speed and danger, this homemade go-kart might seem like a joke. But you can’t be further away from the truth. It features a 5HP Briggs and Stratton engine, 10″ tires, a frame made of pine, and a speed of 21 mph. And it will cost you less than $200 to build it. However, this wooden go-kart might be too dangerous for kids and adults because it doesn’t have any brakes. Use with caution. Do you have an old bike lying around your yard? Then you can buy another used one and make a Bogie for your children. 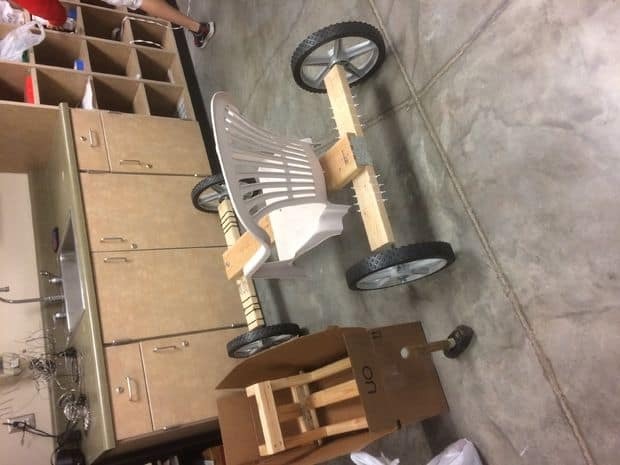 This simple wooden go cart features a frame with sides to prevent hand scraping and a push rod to help you pull the cart along since it doesn’t have a motor. The builder advises that you don’t pay attention to his dimensions but make the kart to match your children’s size. 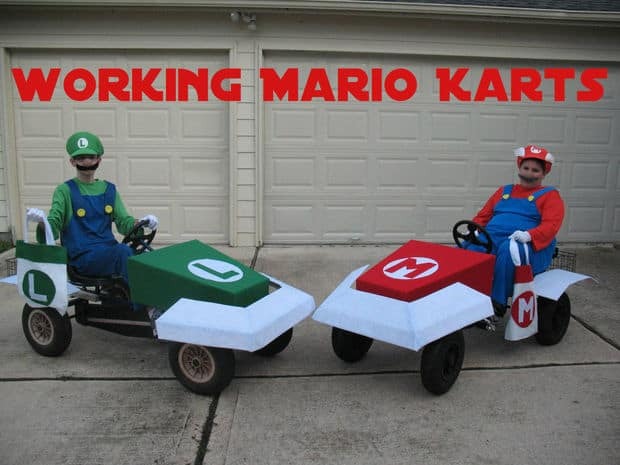 For the fans of Super Mario, this go-kart design is a dream come true and an excellent idea for a Halloween ride. And the great thing is that you can use almost any riding toy vehicle and turn it into this cool racing kart. 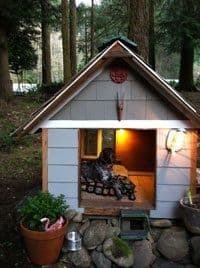 To make it, you’ll also need two-three cardboard boxes, duct tape, cardboard cutters, some felt, and a glue gun or a spray adhesive. As a bonus, the builder has added a wire basket at the rear so that you can carry your threat bag comfortably. Do you want to try something crazy? Then get an old recliner, a go-kart frame, and 212cc engine and build this amazing go-kart that will leave all your neighbors speechless. 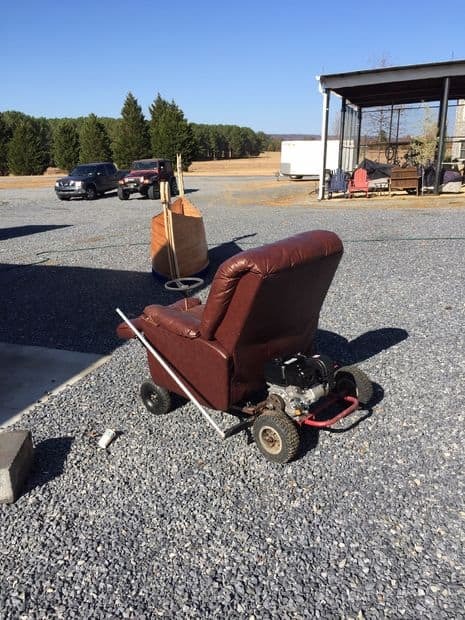 But don’t worry if you don’t have an old recliner, the plan will work with almost any chair. For the throttle, you can break apart a used bicycle and use its brakes. You can also make a handle out of some light and long pipes. 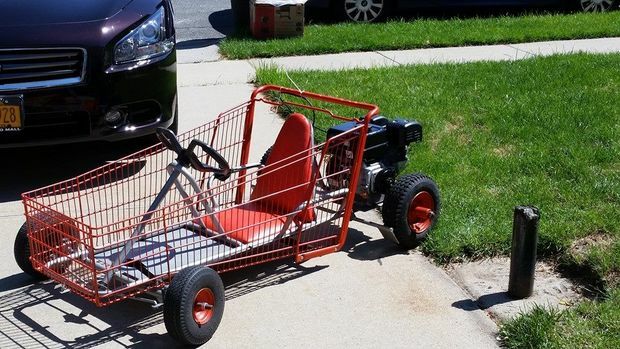 In just four steps you can turn a shopping cart into a fascinating fully functional go-kart. You just need an old go-kart base (you can find used go-karts online) and two shopping carts because one basket will be too narrow for you to sit comfortably. To power it, you’ll need a simple 212 cc engine. 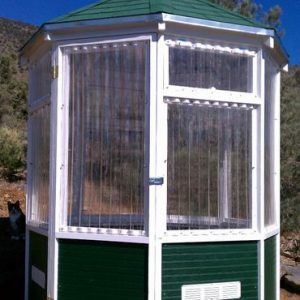 You can try to build one if you have the necessary skills or buy an old one from the Internet. 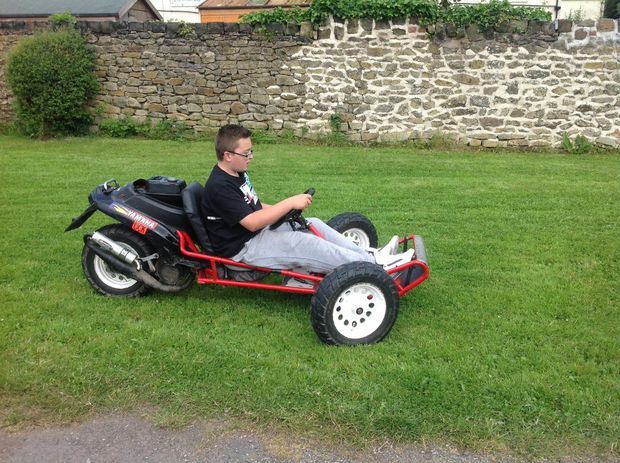 Have you ever wished for a remote controlled off the road go-kart? Then you can finally make one thanks to this plan which will teach you how to build a wireless controlled kart. This one has two DC motors for a speed of 15 mph and off-the-shelf Wii remote for control. 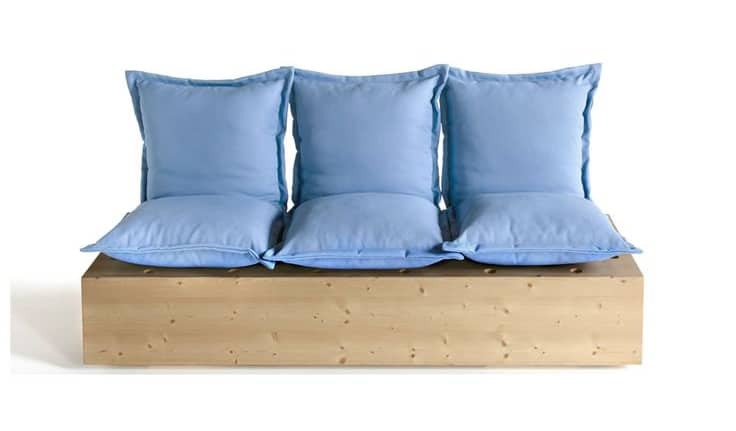 You can make it with common DIY tools, and the necessary code is available for download. However, keep in mind that it’s very specific to the components used by the builder. What’s great about his fast go-kart design is that you can customize it to suit your needs by stretching or shrinking the dimensions. To make it easy for the builder, the plan requires one type of metal, and there is a list of resources and where you can buy go-kart parts. Moreover, the design is available in PDF format for your convenience. 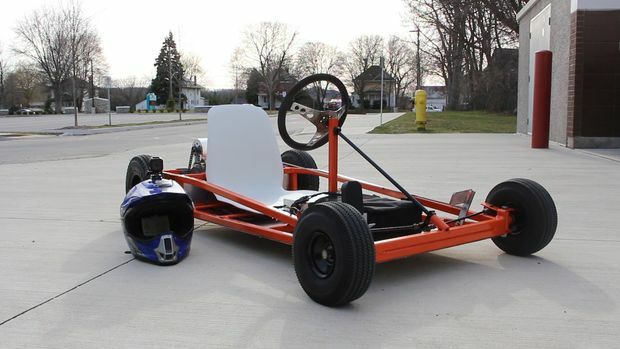 This motorized go-kart is perfect for those that love speed and danger. The project is also ideal for beginners because there are enough step-by-step instructions and diagrams to help you. What’s more, you can change the design and use any whatever motor you want. There is also a video guide and some extra aid for those that need it. Do you want a two seater go-kart so that you can go racing with your buddy? Then this is the design for you. It features dual suspension, a 10 HP motor, hydraulic brakes, adjustable alignment and steering, and 18″ rear wheel. There are enough diagrams to see you through the building process but keep in mind that this is a heavy-duty machine so be careful. Having done so much research on these fun, downhill racers, we uncovered a variety of extra topics we’re considering covering in the future. Check out the list below and let us know which topic area interests you for the next kart racing article we publish! The lighter you are the more acceleration you’ll have, but the heavier you are, the more grip you’ll have. In this section, we’ll give you guys five tips to help you get that competitive racing edge and if you’re anything like me, you hate losing. Follow some simple rules and you should enjoy your racing and hopefully get up to the winner’s podium a lot more. Okay, so tip number one. Once you get into your car at the track, you want to be sitting fairly close to the steering, and you want to do this for a couple of reasons. When you’re trying to drive aggressively and fast, having the wheel closer to your chest means your reactions are faster and you can turn the wheel now. This doesn’t apply in everyday driving when you’re sitting in your car, nice and relaxed. So you know this is a race and you want to make every second count. So then, the next reason is that sitting close to the wheel puts more weight over the front wheels, and this will help you to turn into corners at a greater speed. Tip two– find the racing line as fast as you can. Generally, if you’re doing a race at the track, you’ll get a chance to qualify for a good position- try and follow someone that is fast and see where they position the Kart coming into and out of corners. If you’re not on the racing line, you won’t be as quick and your grip will also suffer, which is something I’ll address in the next tip. You want to get the cart going as fast as possible, but with the corners of the track. You’ll need to drive in wide arcs and get the cart to be in a straighter line as possible. This will, in turn, keep the revs up on the car and give you more speed from corner to corner. The apex is the point where you go from entering a corner to exiting and if you can hit that apex with good speed, you’ll also get a good exit, speed. Tip three is to avoid drifting and sliding- drifting sideways and sliding around the track causes the car to lose. With a lot of speed you can get bogged down in the revs- you want to stay as smooth and as clean as possible when racing. If you’re finding that you are slipping around the track and you need to adjust your driving and quickly now, don’t be afraid to use the brake. The best drivers in the world that race Formula One cars are masters at braking and slowing the car down to avoid sliding sideways controlling the car to go as fast as possible also means not overshooting the apex or drifting. Listen to the revs and you’ll hear the Kart bog down. If you slug around too much tip 4 get past slower drivers as soon as possible. This sounds obvious, but if you’re getting held up by someone that is faster than you sorry by someone that is slower than you and the leader or other drivers are in front of that person and you’re going to be only going as fast as that person in front, so get past and put your card into a position to make a pass. I hear friends of mine saying that you know there’s no room to pass on this track, but there is an up to it. You know you’ve got to get as close as possible and dive into the inside, taking care not to smash into the side of anyone else. So you know if you’re good at driving, you can actually get around the outside of somebody, but you know my tip for now is get past them on the inside. If you can the more time you spend behind someone the more time you’ll lose on the leaders and the more chance someone else has to catch up and pass you so tip. Number five is the last tip and you know my biggest tip of all. Every time I go go-karting is aggression, aggression, aggression. I used to think that I was quite good at go-karting, but for a period of a few years I could never win. I always came second or third, something clicked I needed to be that alpha dog, that guy, that always wins, always gets proposition and always comes first. You’ve got to lose that fear, go flying into those corners and get that cart going as fast as you can get past this little guys and then get to the next one, and the next one you’ll see be getting up to the fast guys that can really handle the car as well. Once you start getting fairly good at karting, you’ll need to use your whole body, not just your eyes, to see angles. You know lean your head to the side as you answer a corner, and that will help you shift your weight to the inside corner with the car so get a better grip. You won’t feel like you’re going to fly off the corner- use your legs to hold on to the center steering column of the kart. That’s our list! 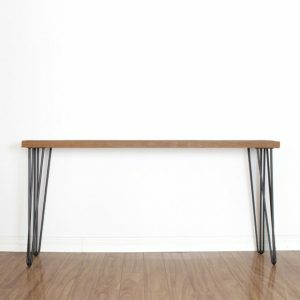 Many woodworkers and engineers use these plans to assemble their own custom-build. Or sometimes they peruse social media and discover innovative builds from across the internet. 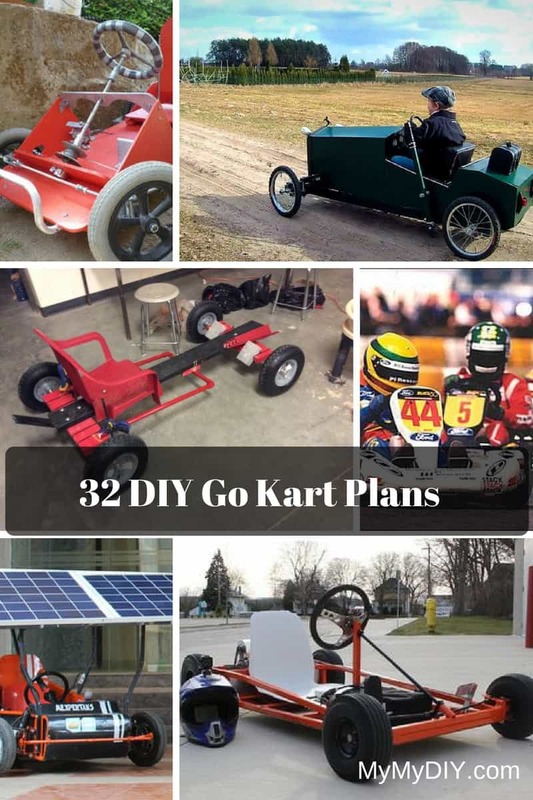 If you end up building one of these DIY go karts on our list, let us know in the comments section below and we’ll showcase your design on our site!